In the original article, there was an error in the title. 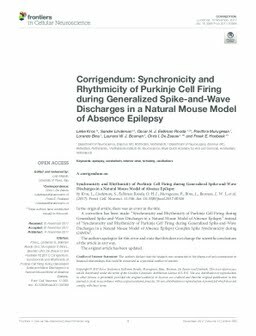 A correction has been made: “Synchronicity and Rhythmicity of Purkinje Cell Firing during Generalized Spike-and-Wave Discharges in a Natural Mouse Model of Absence Epilepsy” instead of “Synchronicity and Rhythmicity of Purkinje Cell Firing during Generalized Spike-and-Wave Discharges in a Natural Mouse Model of Absence Epilepsy Complex Spike Synchronicity during GSWDs”. The authors apologize for this error and state that this does not change the scientific conclusions of the article in any way. The original article has been updated.